What fittings and adapters will I need for my application? We have a schematic drawing that shows our grease extension hose system including all of the fittings and adapters and their uses. You can find this schematic on our System Overview page. What hose ends come installed on the grease fitting extension hoses? All of our grease fitting relocation hoses come with the same threads. The bearing end of the hose has a 1/8″ MNPT. This thread will fit many grease ports as-is. We have adapters available to adapt this thread to 1/4″-28, 7/16-27, 6mm, 8mm, 10mm, 1/8 British Tapered Thread, and 1/8″ British Parallel Thread. These threads will work the majority of the grease ports in use in the US. The other end of the hose has a bulkhead fitting with a 1/8″ FNPT to accept a grease fitting with a 1/8″ MNPT. A Zerk type grease fitting is included. The bulkhead fitting can be installed into one of our bulkhead mounting blocks or into any 7/16″ hole in material up to 1/2″ thick. What fitting threads are compatible with your system? Both hose ends of our relocation hoses use a 1/8″ NPT thread. Other fittings are also 1/8 NTP. Thread adapters have a 1/8″ NTP Female end. The male, or bearing end of our thread adapters will be whichever thread is chosen from the drop down menu. This system will fit many bearings with 1/8″ NPT grease ports as is. Thread adapters are available for bearings with threads that are 1/4-28, 7/16-27, 6mm, 8mm, 10mm, 1/8 BPPT, and 1/8 BPTT. Can I use a T-fitting or splitter to grease multiple bearings from one supply hose? We recommend against it. Grease, like many things, will follow the path of least resistance. Dried grease, different hose lengths, different bearing temperatures, and other things will make one path easier than another. It is possible that grease would reach one bearing while other bearings are left dry. We recommend one hose per grease fitting. How is hose length measured? We measure hose length from the bulkhead at the grease fitting end to the end of the thread at the grease port end. The longest hose length offered on your website is 12 feet long. Can I order longer hoses? We limit our hoses to 12 feet because of the delay it takes for the grease to reach the far end of a longer hose. These hoses expand slightly as the grease is pumped into the hose. 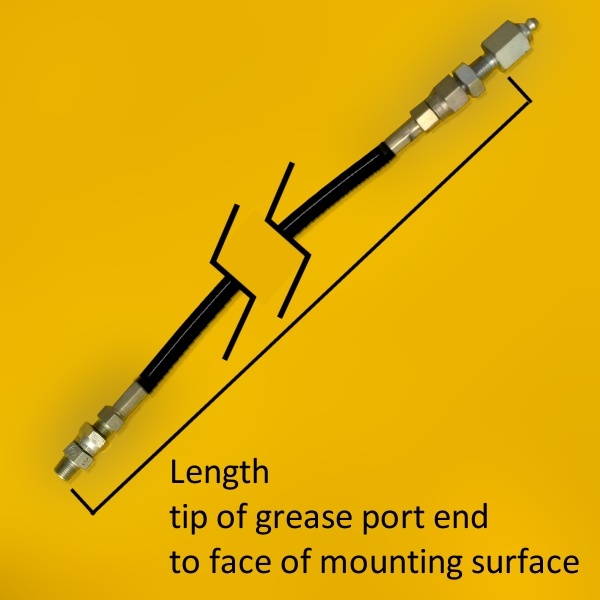 Over the next few seconds, the hose slowly contracts as the grease moves to the far end of the hose and into the bearing. At lengths over 12 feet, this takes long enough that there is a real risk of over-greasing the bearing. The tendency is to continue to pump grease into the hose until the tech feels a difference in pressure or until the tech hears grease enter the bearing. Both of these methods will leave extra grease in the hose that will eventually make its way, under pressure, into the bearing. We wanted you to be aware of this issue before ordering longer hoses. If you would like a quote for hoses longer than 12′ email us with your requirements and we will send you a quote. We ship worldwide. We use Priority Mail for all orders shipping to US Addresses and Priority Mail International to ship worldwide. Shipping Costs will be calculated during the checkout process. Since each grease extension hose is custom made to fit your application, production times vary depending our our work load. Many orders ship the next day but production times can take 2 or 3 days from the date of your order. Once shipped, USPS Priority mail takes 2 to 3 days within the US and Priority Mail International typically takes 6 to 10 days. Customs in your country can add considerable delays. Yes. When placing your order, use your address as the billing address and use your customer’s information as the ship-to address. We always include a packing slip without pricing in each package we ship. You can place your order using PayPal, a major credit card, or by mailing a bank check. All of these payment options are available when checking out. To create a printed quote, visit our product catalog page and build your order by placing your items in your shopping cart. Once your shopping cart is complete, continue on to the checkout page where you can enter your shipping information and print your shopping cart. Contact us to make arrangements for your return.